Establish a legacy giving plan. The Jewish Community Alliance Legacy Society has been established to celebrate and thank those who have made a philanthropic investment in our mission and wish to continue that investment with a planned gift in their will or estate plans. We are privileged and honored to recognize those who have engaged us with these intentions. Furthermore, we will then empower your gift by connecting you with our philanthropic mission and, with your permission, include your name alongside other members of the Legacy Society on our web site, in publications and listed on our future Legacy feature. We promise always to match your gift to your philanthropic investment in the JCA and always be good stewards of your trust and your gift. Our professionals are not attorneys, but we have received extensive training in planned giving to better serve you. 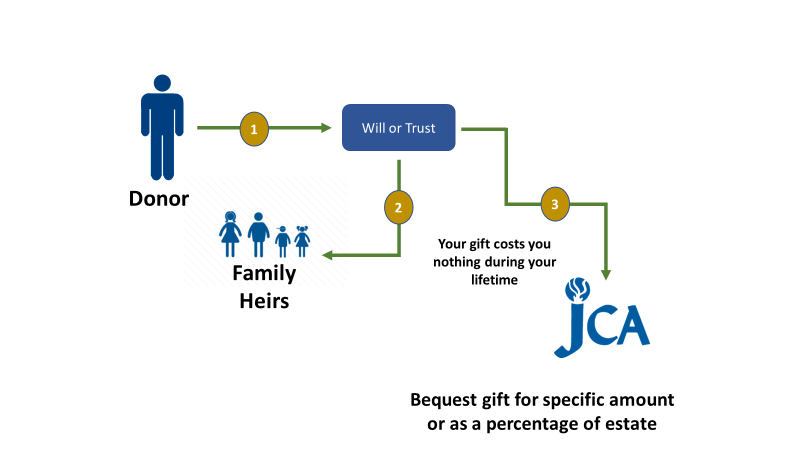 We understand that you have many questions about tax law, estate planning for your family and loved ones and how it may all come together to make a planned gift to support the JCA and its mission. We want to be a resource for you, so you may gain a general knowledge about planned giving and how you may match your philanthropic interests to our JCA programs. To this end, we are providing information that we hope will answer questions that you may have about leaving a legacy at the JCA. Here at the J we understand that our commitment to be the catalyst and facilitator of community change is equal to your commitment to this same mission. Because of this shared commitment we offer you the opportunity to assign your gift, in part or whole, to your designated areas. Gifts made to general operations fund our yearly programs and give us the opportunity to expand these services. The JCA team is committed to being good stewards of your investment in us. We are committed to being good stewards for you, and always use those gifts made to our general operations with minimal costs and high-performance expectancies. Investing in our children is investing in our community’s future. Since 1974 the Michele Block Gan Yeladim Preschool has provided unparalleled excellence in early childhood education. Our toddler, youth and teen programs provide a culture of growth and personal character building through sports, theatre and summer programs. Here at the JCA we offer art classes, film and concert series and theatre programs for all ages. We provide the basis for individual courage. Cherishing and preserving our Jewish heritage, culture and faith are so very important to all of us. The JCA recognizes Jewish holidays with special events and provides educational content about our culture for our entire community. At the JCA we understand how important our personal health is for everyone in our community. To this end we offer a state of the art exercise facility, expert and professional staff, wide variety of programing and special events. All designed to build a community for all members focused on individual health for all ages. Adults, families and seniors enjoy the sports and wellness activities at the JCA. All of these are designed to improve individual and family’s quality of life. The J Institute provides a unique opportunity for everyone in our community to come together, learn something new, and explore the world around us. This award-winning program offers ever-changing class, programs and events tailored for all adults with varying interests. Members of the Jacksonville community can learn about the centrality of Israel to Jewish peoplehood. Your support will allow the JCA will continue to deliver this vital content to our community via member trips and staff experiences in Israel, which will provide them training as informal Jewish educators when returning to the Jacksonville. The JCA proudly collaborates with other non-profit organizations, such as Hope Haven, and other Jewish agencies such as River Garden Senior Services and Jewish Family and Community Services. Help further these important community partnerships, which facilitative innovative programs to further cross cultural and interagency reach. Contributions to this fund help underwrite the cost of providing theatre productions to low/moderate income children. The JCA’s educational live theatre series, Magic Wardrobe, teaches character development through positive messages about morals, ethics and values, reaching over 18,000 children, annually. Local elementary age children from all socioeconomic levels participate at a reduced or waived fee. Plays are written specifically to mirror the curriculum being taught in classrooms and enhance development of academic skills through live theatre. This series has made the JCA the second most popular elementary school field trip destination in Jacksonville. This is often the first or only live theatre experience for these children, and it occurred in a Jewish building. Contributions to the Maccabi Fund provide financial assistance to deserving Jewish athletes in Jacksonville participating in the annual JCC Maccabi Games, sponsored by JCC Association of North America. Jewish teen athletes, ages 13 to 16, from JCCs throughout the United States, Canada, Israel and all over the world participate in a week of sports competition, social activities and Judaic programming at the JCC Maccabi Games. The Jewish Community Alliance is a “town square” for the exchange of ideas and thoughts. Our programs are intended to educate and inform the greater Jacksonville population and promote values of acceptance and inclusion. The JCA is a common meeting ground of the community, and these values are the foundation of our mission. Supporting tolerance programming at the JCA will help to facilitate an inclusive society where all people can live with dignity and mutual respect. Remembering the Jewish Community Alliance in your will or living trust will ensure a vital, strong Jewish community for the many generations to come. A bequest to the Jewish Community Alliance may offer an opportunity to reduce estate taxes while building and preserving our community well into the future. The addition of just a few sentences in your will or living trust will allow the JCA to continue its important work as the Jewish community’s common meeting ground. Your bequest may be unrestricted to provide for our general operating costs or restricted to support one or many of our programs. You may restrict your bequest for a certain dollar amount or as a percentage of your estate. You may even wish to have a discussion about naming a particular program, fund or capital expense. Most assets in your estate may be used to satisfy your bequest and your taxable estate may be reduced by the amount of your contribution. Life insurance is a wonderful yet often overlooked tool for making a gift. There are a few ways to make a gift using life insurance. 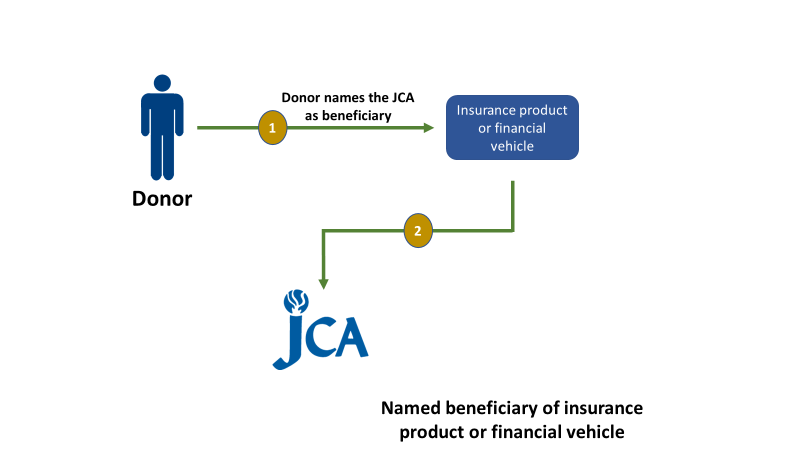 You may name the JCA as a whole or partial beneficiary of a life insurance policy. You may donate a paid-up policy from which you no longer need the benefits. Or, you may purchase a new policy and designate the Jewish Community Alliance as both the owner and beneficiary of the policy. You may give the JCA a policy and make annual gifts equivalent to the premium and let the JCA take over the payments. Finally, you may choose to purchase additional life insurance, for the benefit of your heirs, to offset the value of charitable gifts made from your estate. Many of our friends have certificates of deposit, mutual funds, stocks or other accounts at a bank or financial institution that they may wish to consider making the JCA beneficiary. This allows the donor the flexibility to use the asset, in part or in whole, when needed. In 2018 Americans have surpassed the $25 Trillion mark in retirement account values, and that number should continue to grow. 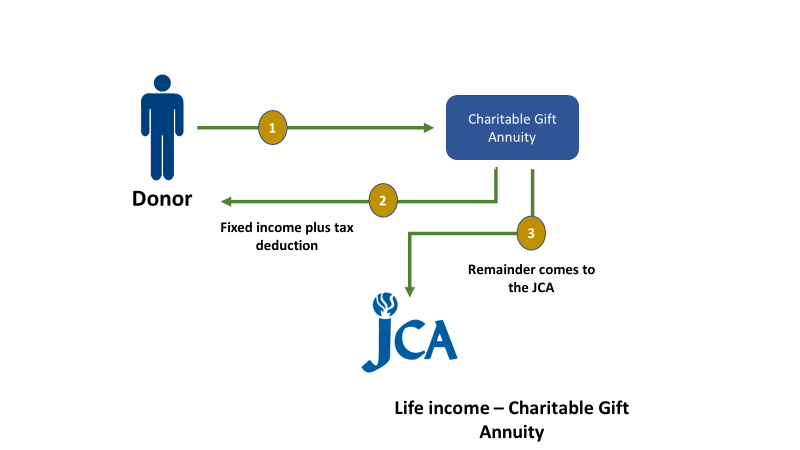 Some donors may find that naming the JCA as a beneficiary of a qualified retirement plan is a very good choice as a planned gift. 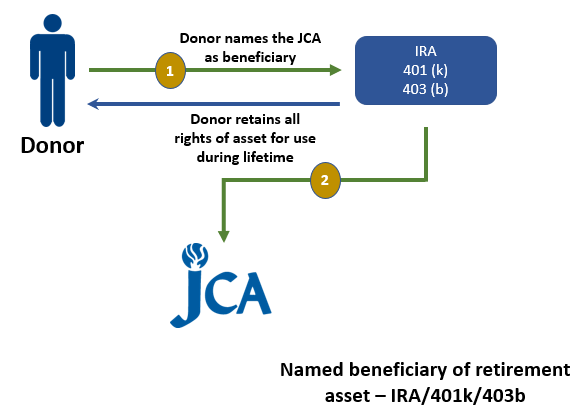 Naming the JCA as a remainder beneficiary of your IRA, 401(k), 403(b) or other qualified retirement plan is as simple as contacting Lior Spring at lior.spring@jcajax.org and your financial management company. Retirement plan proceeds paid after death are subject to both income and estate taxes. Because of this double taxation, possibly as high as 75% or more, these are not ideal assets to leave to your heirs. Instead, it would be more beneficial to leave other less heavily taxed assets to family members and use your retirement assets to provide for the charitable causes you care about (the proceeds from your retirement plan will pass to the JCA tax-free). Simply fill out a change of beneficiary form provided by your plan administrator and designate the Jewish Community Alliance (Federal tax Id # 59-2620208) as a beneficiary. You may name the JCA as a contingent beneficiary of your retirement plan, in which case the JCA will receive your retirement plan assets only after your spouse (or other designated primary beneficiary) has passed away. You will reduce your estate taxes and your heirs will avoid having to pay income tax on the retirement assets they receive. For some donors, gifts of real estate or land are the best gift to fund their legacy. 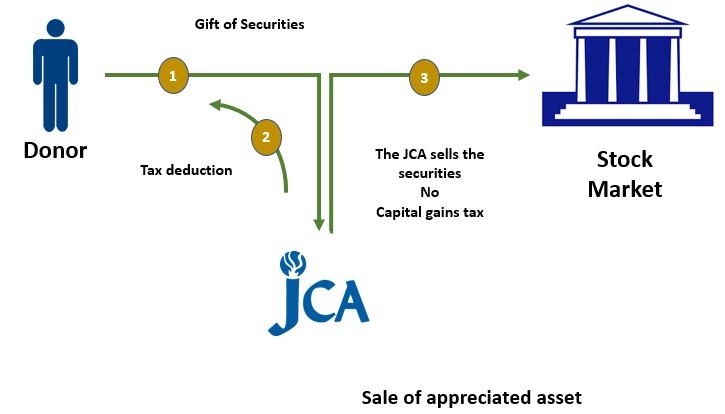 You may significantly increase the amount of your gift to the JCA by taking advantage of applicable tax benefits, most notably that you will be able to generally deduct the fair market value of the asset and avoid paying capital gains tax (deductions for gifts of appreciated property are limited to 30% of your adjusted gross income, but the excess may be carried forward for five years). Gifts of real property may take several forms. In addition to outright gifts of real estate, real estate may possibly be used to fund trusts and gift annuities. 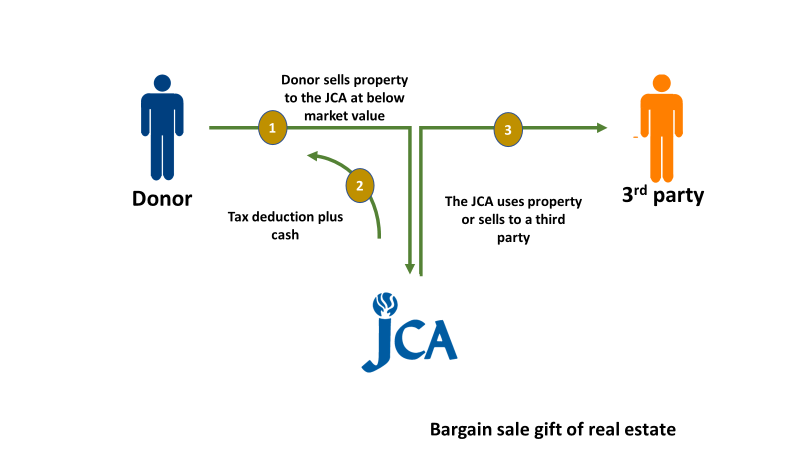 Bargain sales – Donor sells property to the JCA at below market value. The JCA sells the property at full market value. The donor receives a tax benefit and an income stream. Donate long-term appreciated stock, that is held for more than one year, and you may deduct its fair market value. Because it is a gift and not a sale, you avoid capital gains tax (for stocks that have been held less than one year, you can only deduct your adjusted cost basis). Consider choosing appreciated stock with the greatest capital gain to take maximum advantage of this tax savings. Appreciated stocks may be used to make outright charitable gifts or used for life income gifts, such as charitable gift annuities and a charitable remainder trusts. In these situations, you get a current charitable deduction and enjoy an income stream from the property for yourself or a loved one. For those donors who wish for even more flexibility with their gifts we may assist with a Charitable Remainder Trust or Charitable Gift Annuity which will provide a life time, or term of years, income and an immediate income tax deduction today – while ensuring your gift at a later date. You may establish either gift types with cash or securities. If you donate appreciated securities, you will avoid capital gains. You may even direct the remainder to one of the established Legacy Funds. 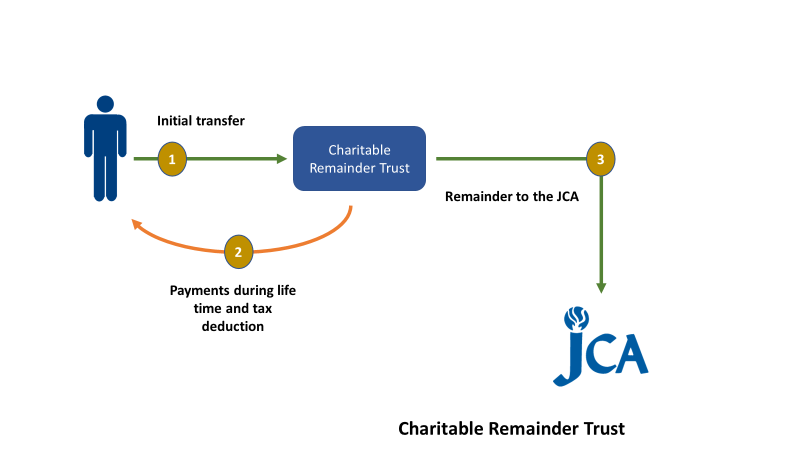 A charitable remainder trust is an estate planning tool that gives you income for life or a term of years and creates a gift of the remainder to the JCA upon termination of trust. Assets that have substantially appreciated in value, but are providing a low return are well suited as gifts. You may avoid capital gains taxes, lower your income taxes and earn higher returns with a charitable remainder trust. Annual income, often for donor and spouse. Income tax deduction at the time the trust is created. Estate and gift tax savings when created testamentary. May establish with cash, securities, and certain real estate. An IRA or other retirement plan assets may be used to fund a testamentary charitable remainder trust for the benefit of family members after the donor’s lifetime. For many donors the simplicity of a charitable gift annuity that provides a life time income is the perfect planned gift. In exchange for your gift to the Jewish Community Alliance, we commit to pay you (and up to one additional beneficiary) fixed income for life to help support yourself, spouse, partner, parent, or other loved one during retirement. An income tax deduction at the time the gift is made. Favorable treatment of capital gains for gifts of appreciated assets (such as marketable securities and certain real estate). Donor assets are pooled with other gifts, similar to the structure of a mutual fund. In exchange for a charitable gift, the donor or designee receives income payments based on the rate of return for a common fund. A pooled income fund allows you to make a gift now, gain an immediate tax deduction, and generate income for life with a simple gift of cash or securities to the Jewish Community Alliance. May make additional contributions on a regular basis and receive an income tax deduction at the time each gift is made to the fund. Pays immediate income to the donor or donor’s designee for life. Can avoid capital gains tax on appreciated assets. After the donor or donor designee’s lifetime, the remainder interest in the fund will be transferred to our unrestricted endowment and will be a legacy to ensure the continuity of generations to come. Remembering the Jewish Community Alliance as part of your legacy giving plan, or signing a letter of intent to do so, may help you make a larger gift than you thought possible. We will work with you to develop a strategy that fulfills both your charitable goals and financial needs. Call us today at (904) 730-2100 ext. 318 and we can work with you to customize a plan that meets your philanthropic needs. The Jewish Community Alliance is happy to send you detailed information about our Legacy Society and simple to understand planned gift options. Make this request by emailing lior.spring@jcajax.org.